Working for a church can be hard. Really hard. A pastor’s life and job is extremely complex. Consider this: A pastor’s employment, their deep personal faith, and personal family life are all wrapped up into one big interdependent situation. It can feel lonely at times. It’s hard to quantify if you’re doing well and making a difference. Discouragement runs rampant in the pastorate. And this doesn’t just affect pastors, but all church staff of any type. The complexities of church work coupled with its integration of personal life and faith values makes for a daunting career. Church staff do not get enough encouragement. Your staff, no matter how many there are, do not get enough encouragement. You may thank them periodically, a church member may say thank you during pastor appreciation month, you might even have a small financial bonus system set up in place to tell staff they’re doing a great job. But in my experience, nothing shows more encouragement than a simple note. 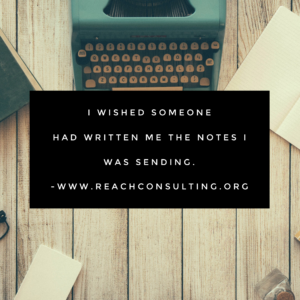 Write out a very short simple letter to someone on staff who you think is doing a great job. Depending on the size of your staff, do it weekly, or monthly. It only needs to be a few sentence long and acknowledging something they’ve done recently that went well. Or write a note expressing you are praying for them in a personal situation you happen to know about and you believe they can persevere. But write it out by hand or at least print it out on a nice sheet of paper and sign by hand with ink. Put their name on an envelope and just leave it in their staff mailbox while you leave for the evening. Don’t send an email…it’s too impersonal. Writing something out shows care and that you took the time to really craft your words. Frank Blake, former CEO of Home Depot, took this approach. As the fourth largest retailer in the US, Blake couldn’t write a personal letter to each employee. But he did write several dozen every month and he based them on information store managers had sent him. At first, employees thought they were fake, but as more and more people got them with personalized information about the work they were doing, word spread that it really was his handwriting. Morale increased exponentially among the workforce. Why? Because it showed the guy at the top actually cared. It forced me to remember that everyone on my team had value. It reminded me to pray for them as I wrote out their letter. It makes a difference, I promise. On one occasion, I sent a coworker a letter during a time I knew he was struggling. Months later, he confided in me that he was considering resigning during that difficult time. Then he got my letter. He’s still at the same church, writing letters of his own. If you are a pastor, write your staff encouraging notes. Show them you do care and think about them and know they’re struggling and want them to succeed and that you believe in them! If you’re a church leader or board member, write the pastor a note expressing the same. If you’re a volunteer, write your leader or other volunteers a note. It will make a difference. It will encourage them. There was one more thing I realized after doing this for so long: I wished someone had written me the notes I was sending. I think it would have encouraged me. Pastors and church leaders, what do you do to encourage your staff?